At least seven people died during violent clashes between supporters and opponents of the military-backed government as Egypt marks the third anniversary of the 2011 uprising which ended with the overthrow of President Hosni Mubarak. Police broke up anti-government protests with tear gas, and arrests were reported in Cairo and Alexandria. Hundreds have died since July when the army deposed President Mohamed Morsi. The government has said extra security measures are in place for Saturday. Egyptian Interior Minister Muhammad Ibrahim urged Egyptians not to be afraid to go to events marking the anniversary of the uprising. Thousands of supporters of the military and the government have gathered in high-profile locations including Tahrir Square – the focal point of the 18-day 2011 popular revolt. 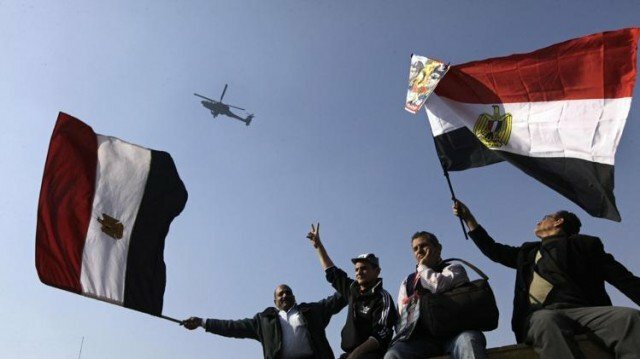 Participants waved Egyptian flags and banners showing army chief General Abdel Fattah al-Sisi, whom many urged to run for president. But police dealt harshly with anti-government protesters in Cairo and elsewhere. At least seven people have died – four in the greater Cairo area, two in the southern city of Minya and a woman in Egypt’s second city, Alexandria. Shortly before 8 a.m. on Saturday, a bomb was thrown at the wall of the police training academy in the Cairo suburb of Ain Shams, reportedly injuring one person. Six people died in four bombings in Cairo on Friday, along with at least another dozen people killed in clashes with security forces.